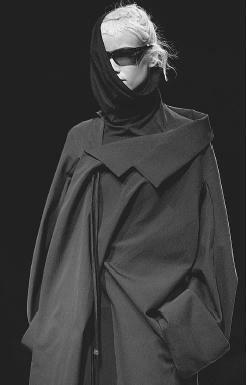 Yohji Yamamoto, fall/winter 2001-02 ready-to-wear collection. fragrances, 1994; first fragrance, for women, Yohji, 1996; debuted womenswear collection in New York, 1996; opened new store in London, 1997; second women's scent, Yohji Essential, 1998; first men's fragrance, Yohji Homme, 1999; opened first freestanding boutique in SoHo, 1999; considered introducing cosmetics line, early 2000s. Exhibitions: A New Wave in Fashion: 3 Japanese Designers, Phoenix Art Museum, Arizona, 1983. Awards: Fashion Editors Club award, Tokyo, 1982; Mainichi grand prize, 1984, Fashion Group International, Master of Design, 1997. Address: San Shin Building 1, 1-22-11 Higashi Shibuya-ku, Tokyo, Japan. Yohji Yamamoto, with François Baudot, Paris, 1997. Phoenix Art Museum, A New Wave in Fashion: Three Japanese Designers [exhibition catalogue], Phoenix, Arizona 1983. Koren, Leonard, New Fashion Japan, Tokyo, 1984. Fraser, Kennedy, Scenes from the Fashionable World, New York, 1987. "Yohji Yamamoto: Fashion Designer," in Blueprint (London), February 1987. "In Pursuit of Excellence," in i-D (London), May 1987. "Mr. Yamamoto Comes Back to Town," in Blueprint (London), December 1987. "Yohji Yamamoto: La vie d'artiste," in Elle (Paris), 19 September 1988. Montagu, Georgina, "A Life in the Day of Yohji Yamamoto," in the Sunday Times Magazine (London), 26 February 1989. Flett, Kathryn, "Yohji by Knight: Photography at Work," in The Face (London), April 1989. Deslaudieres, Ainree, "Le long voyage á la recontre de Yohji Yamamoto," in L'Officiel (Paris), May 1989. "Yohji Yamamoto: Les femmes et moi," in Vogue (Paris), November 1989. Sudjic, Deyan, "Go Yohji, Go!," in the Sunday Times Magazine (London), 2 December 1990. "Yohji Yamamoto in Deal to Develop Fragrance," in WWD, 5 July 1994. Koshi, Lorna, "Yohji's New York Minute," in WWD, 12 December 1994. "The Paris Collections—The Ideas of March: Yohji Yamamoto," in WWD, 17 March 1995. Kerwin, Jessica, "Yamamoto Bites into the Big Apple," in WWD, 26 March 1996. Aktar, Alev, "Yohji Readies Scent," in WWD, 12 July 1996. Born, Peter, "Yohji Scent to Make U.S. Debut—Quietly," in WWD, 31 January 1997. Foley, Bridget, "The Master Builders: Three Paris Titans Show How It's Done—Karl Lagerfeld at Chanel, Yohji Yamamoto, and Jean-Paul Gaultier)," in WWD, 16 March 1998. Ozzard, Janet, "May Debut for Yohji Homme, in WWD, 2 April 1999. Chua, Lawrence, "Yohji Yamamoto—Exploring the Yamamoto Cult," in WWD, 13 September 1999. "Punk Power or Rich Romantics," in WWD, 29 February 2000. "A Languid Air—Designer Yohji Yamamoto's Spring Collection," in WWD, 1 November 2000.
dressing by synthesizing Western clothing archetypes and indigenous Japanese clothing. Refusing to accept traditional ideas of female sexual display and reacting against the Western notion of female glamour as expressed in titillating figure-hugging garments, Yamamoto employs a method of layering, draping, and wrapping the body, disguising it with somber, unstructured, swathed garments based on the kimono that ignore the usual accentuation points. Uncompromising to Western eyes, Yamamoto is in fact investigating the traditional Japanese conviction in beauty being not naturally given but expressed through the manipulation of the possibilities of the colours and materials of garments. Consequently, Yamamoto's clothing construction is viewed in the round rather than vertically, not from the neck down as in Western fashion, but a rectilinear, two dimensional approach that explores the visual appeal of asymmetry, the notion of the picturesque that plays an important part in Japanese design philosophy where irregular forms are appreciated for their lack of artifice and thus closeness to nature. Therefore, Yamamoto's garments have strange flaps, pockets, and layers, lopsided collars and hems, set off by the body in motion, and the labels inside are inscribed with the epithet, "There is nothing so boring as a neat and tidy look." By not referring to Western fashion but to a fixed form of Japanese dress that has been developed and refined over the centuries, Yamamoto produces anti-fashion—non-directional garments that ignore contemporary Western developments of the silhouette but influence Western designers in turn. Beauty is more indefinable, to be found in the texture of materials rather than applied decoration, with the use of fabrics like linen and rayon that have been deliberately chosen and developed for their likelihood of wrinkling and heavy knitted surfaces. Like a number of Japanese designers, Yamamoto is interested in developing new materials. Yamamoto's source material is idiosyncratic and derives from a vast library that he draws on for inspiration. One book to which he consistently refers is a collection of photographs by August Sander, a photographer based in Cologne in the early 20th century, who took photographs of representative types in the everyday clothes that sharply reflect their lives. Yamamoto is also inspired by utilitarian outfits such as the protective clothing worn by women munitions workers in the 1940s, and has been known to reproduce the coat lapel worn by Jean-Paul Sartre discovered in an old photograph. Notable for his relentless use of black, a colour traditionally associated in Japanese culture with the farmer and the spirit of the samurai, Yamamoto's move into navy and purple in the 1980s was shortlived—he found it roused too many complicated emotions for him! His company, launched in 1976, produces the experimental, idiosyncratic Yohji Yamamoto line, the Y & Y line for men that is moderately priced and extremely successful, made up of an easy to wear mixture of integrated separates and the Workshop line of casual leisurewear. In 1989 Yamamoto, along with director Wim Wenders and producer Ulrich Felsberg, created a film based on his experiences of putting together one of his collections. The result, Notebook on Cities and Clothes, dealt with perceptions of dress, contained interviews with Yamamoto and his staff, and compared the film and fashion industries. The film was released on videocasette in 1993. The following year Yamamoto signed with Patou to produce several fragrances. The first, Yohji, was in development for two years and was released in France in 1996 (in the U.S. in 1997), and was followed by a second scent for women, Yohji Essential in 1998. Yamamoto's first fragrance for men, Yohji Homme, debuted in 1999, as his first freestanding U.S. boutique opened its door in New York's SoHo neighborhood. and the designer was considering a line of cosmetics in the near future. Considered one of the brightest and most creative minds in the fashion industry, Yamamoto's showings consistently draw cheer from fellow designers and the press alike. 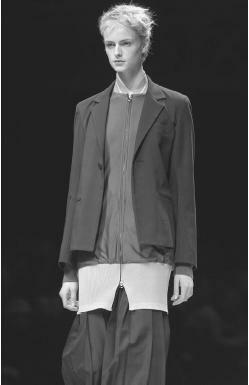 In Paris in early 2000, Yamamoto "used his runway in an elaborate celebration of romance, from start to finish," said Women's Wear Daily, (29 February 2000) including coats, suede dresses, and "fabulous suits, inventively cut and draped." His spring showing in late 2000 was "infused with a quiet elegance," according to Women's Wear Daily (1 November 2000), which further commented, "Do designers have to shout to be heard? Not always. Yohji Yamamoto certainly doesn't."